After nearly three months of recoding everything, it's here. Version 6. So what is new exactly? I do hope you will enjoy it more. There may be some lingering bugs. They'll get squashed very soon. Oh, I should also mention Sonic Boom now has a sub page within animation and will be updated as more information about the series comes available. Looking to explore in the upcoming Sonic Lost World? Good Idea! We had to explore for over three hours (yes, really) in this single act to find this route - the fastest route we could find between the start and the goal. There are loads of different routes, each with different ways to tackle them - and undoubtedly there will be even faster ways than this. The level's 'Color' ability is an option, as are different routes along collapsing platforms. If we stopped to show you all the awesome things, it would be a pretty rubbish speedrun. Sonic Boom, a new Sonic Cartoon! Today Sega has announced a new computer generated animated series titled Sonic Boom (but still a working title) to debut next Fall in 2014 on Cartoon Network. 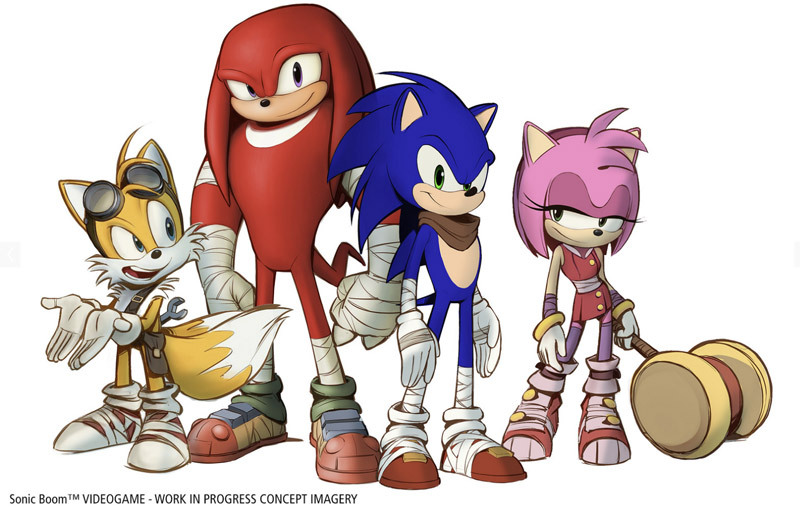 As shown in the teaser image, it will feature Sonic, Tails, Knuckles and Amy. We're also told the format will be episodes of 11 minutes which likely means two 11 minute segments per half-hour episode. Exciting times aren't these? We've got Lost World just a few weeks away, Sonic has been confirmed for Smash Bros just the other day and now we know for sure there's a new animated series underway. Seems quiet here, I know BUT.. there are things happening behind the scenes. A big update to the site is underway... it'll just take a little while before it's ready. I don't have a time table for it yet but maybe another month or two even. (Yes, that big and I started on it back in July so a lot of work has already been put in to it) It's going to be nice. With that said, I'll leave you with an actual email we received last year. This is to my knowledge, legit. Just to let you know our experience today at 3 of yours Sonics. Yes 3 , we first went to the store at [address redacted]. We were gettting our half price shakes since it was 6/20/2012. We sat there 10 or 15 min. in the drive thru after we ordered and finally left. Well next stop was the Sonic at [address redacted]. there we ordered our shakes and they tried to tell us we owed 25.75. Now that was for three shakes. After arguing with them for 10 minutes. We finally left with no shakes. Finally we went to the Sonic at [address redacted]. We ordered there got our shakes FINALLY..and had excellent customer service. I am writing this to let somebody know that I am 52 yrs old and am very saddened by the lack of customer service and caring that i feel many companies have these days. I feel like it's a lack of training and caring weather the customer comes back or not. Just wanted to let you know so maybe in the future somebody will not have the same experience we just had. 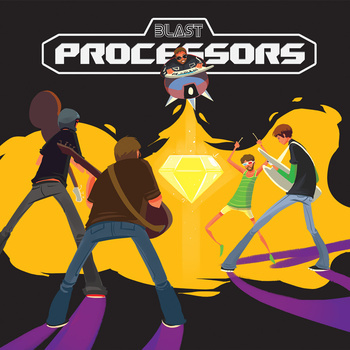 The Blast Processors are a Canadian based, Sega-inspired rock/punk/electronica/synth pop band. They've got four tracks so far, three of them Sonic related. Lyrics are also available on their site. Please do check it out at the link below. Archie Comics have debuted on the Google Play Store and are now having a little special to celebrate. Recent comics are now only 99 cents. No word on how long the special will last. It appears the remaining issues will be available later on. Welcome Archie & Friends to Google Play! Now you can read more than 500 single issues, digests, and digital exclusives anytime, anywhere--whether youâ€™re on the web or your Android phone or tablet. Get started with the gang who started it all in our Archie & Friends Collection, or see what theyâ€™ve been up to in Life with Archie. Sonic the Hedgehog fans can stock up on original Sonic series and expand their collection with the Sonic Universe and Mega Man. And donâ€™t miss star supporting acts from Betty & Veronica, Cheryl Blossom, Jughead, and more Archie favorites! All Archie Comics featured here are just $0.99 for a limited time, so whatcha waitinâ€™ for? 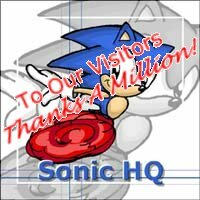 Believe it or not but today is Sonic HQ's 15th anniversary. Hard to believe, I know. 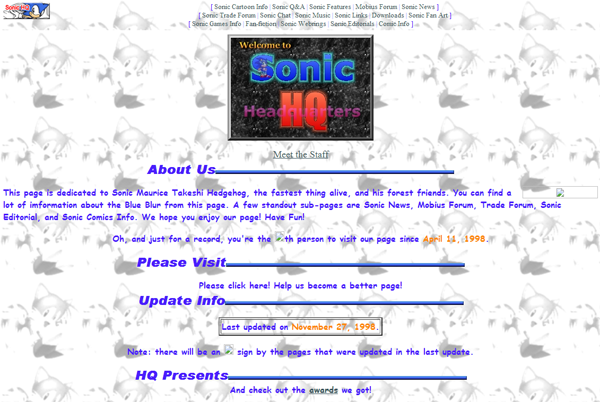 In its honor, I've fixed the images on the original Sonic HQ site that was on geocities in the late 1990s. I don't have all the images, unfortunately. Additionally, if you have a SHQ account, you can opt to have the classic theme seen here through out the site. The option is on the settings page and is what we used for April Fools. 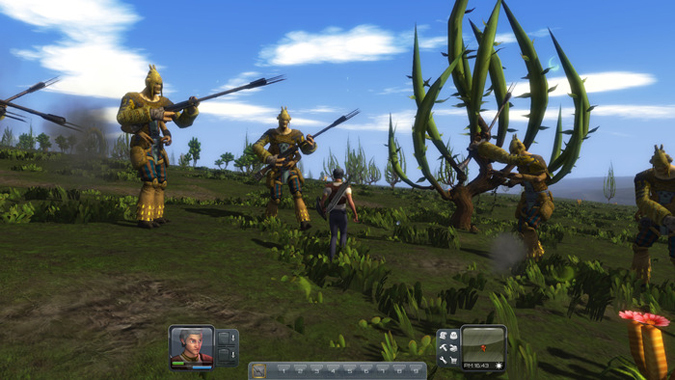 Zifei, the founder of Sonic HQ, is now the head of a team working on an indie game called Planet Explorers. They can't quite do it all themselves though so they're looking for support through Kickstarter. If you're into Minecraft, terraforming, sandbox environments, or even just sci fi please do go check it out! It is still a work in progress but you can now post within our forum. You do have to be logged in. So come drop by. We have bacon pancakes. To make better sense of the upcoming Worlds Collide Saga, a subpage has been created solely for it. In there you will also find solicitations for Sonic Universe 52, which is part 5 of the Worlds Collide Saga. They are in release date order. 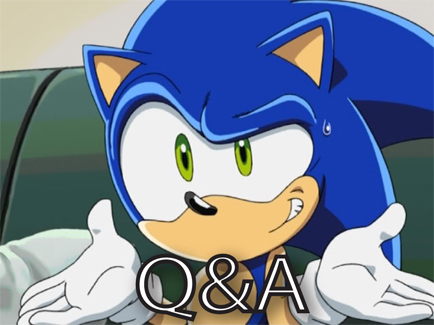 Browsing through the older questions and answers may not be all that exciting but the Dr FexusFan edition of the Q&A is definitely worth the look! In there you will see questions that are just.. a bit out there. These were legitimately asked questions (well almost all of them). Preview pages are now live for Sonic The Hedgehog #244. In addition, I've determined perhaps a few out there would like a Google Calendar of the upcoming ArchieSonic release dates. Right now it's Sonic The Hedgehog and Sonic Universe. I may add the Archives and Selects soon.